Nashville Predators 5K | brian habbe | life ..
Saturday (2/4) was the Predators 5K here in Nashville. Kay has run it a few times but this year was my first, my first time for this race and my first 5K too. Weather was overcast and a little wet but otherwise a good morning for a 30 minute run with a couple thousand hockey fans. The course started at the Bridgestone Arena looped through the Gulch, up to Music Row and then back down to the Arena for the finish. Hilly but at least the last mile was downhill. Running has never been my thing but it did feel good to get out there. 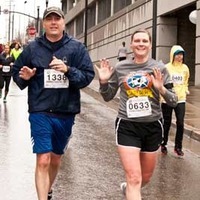 There are more races coming up and with friends running marathons not sure I can continue to sit on the sidelines. But marathons are a long way away!!!….. I’ll stick with 5K’s. Looking Good, we are proud of both of you! Keep up the good work!